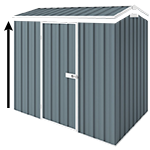 This Spanbilt Double Gable Carport is what you need to keep your car under cover and save it from the strong Aussie sun or hail. *Please note, the picture is for illustration purposes only. This Spanbilt Double Gable Roof Carport is what you need to keep your car under cover and save it from the strong Aussie sun or hail. 15-degree roof pitch and with RHS legs. Engineered to wind rating N3! Concrete slab attachment kit (screw bolts and brackets) are included with the carport. This carport is made to order and manufacturing time can take up to 3 weeks.